In June 2016 the proprietors changed the name from Oliver to TAPA and the style of service from traditional three course to small plates. As Oliver it was probably the best restaurant in Bollington and listed in the Michelin Guide. Scott Oliver and Jaydean Pilling have made a very good name for themselves with beautiful and delicious food, together with excellent service. Located beside the green of the old Market Place. After a short closure for complete refurbishment they have re-opened with the same excellent team but with a different style – small plates & wine bar! Still the same great service and still the same great homemade food. Just in more of a relaxed, simple and social dining experience. NO, it isn’t traditional Spanish tapas! Food: English and continental European cooking style in small plate format. Pricing suggests that each diner may like a selection of three plates. Additional plates available for the bigger appetite! 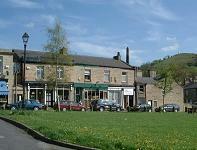 Finding it: Off the main road through Bollington, turn down High Street. 150 metres on the left opposite the Market Place.